In a landmark investigation that’s been compared to Silent Spring, two veteran journalists definitively show how, why, and where industrial toxins are causing rates of birth defects, asthma, cancer, and other serious illnesses to soar in children. Philip and Alice Shabecoff reveal that the children of baby boomers—the first to be raised in a truly toxified world—are the first generation to be sicker and have shorter life expectancies than their parents. 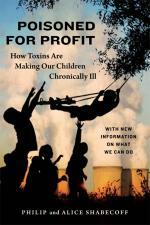 The culprits, they say, are the companies that profit from producing, using, and selling toxics. In piercing case histories, the authors bring readers to places like Dickson, Tennessee, where babies were born with cleft lips and palates after landfill chemicals seeped into the water, and Port Neches, Texas, where so many graduates of a high school near synthetic rubber and chemical plants contracted cancer that the school was nicknamed “Leukemia High.” And they ask a razor-sharp question: Just why are we letting corporations commit these crimes against our children, sabotage investigations and regulations, hire scientists to skew data on toxic impacts, and fend off government controls with powerful lobbying groups? It’s time, they say, for families and the health and environmental communities to fight back, and their painstakingly researched book shows how people are taking action across the country—from pressuring politicians and investigating sickness clusters in their regions to ridding their own homes of countless toxic products like crib mattresses infused with dangerous flame retardants or teething rings steeped in harmful chemicals. Powerful, unflinching, and eminently readable, Poisoned for Profit is a wake-up call that is bound to inspire talk and force change.